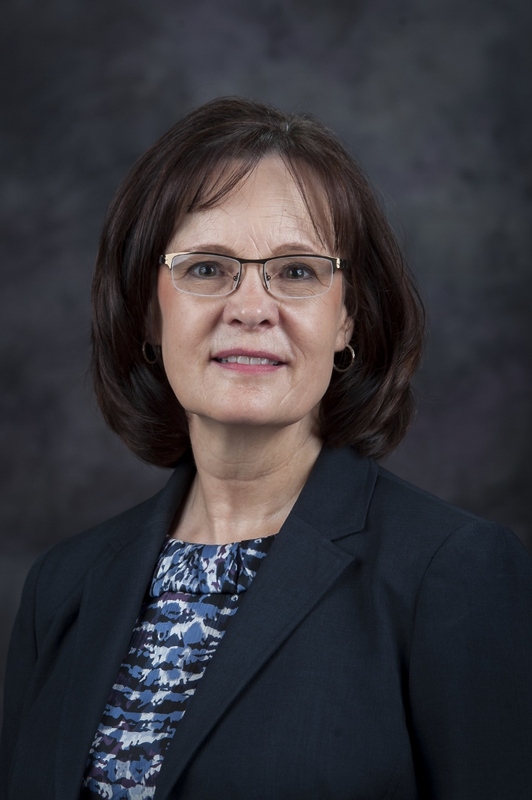 Heather Reed, assistant vice president, also serving as the senior associate dean and director of student life sits down with PFA Intern Annie Jewell to discuss the recent changes regarding student clubs and organizations at Kansas State University. Annie: Heather, thank you for taking the time to discuss the new Center for Student Involvement and what this means for the K-State students. 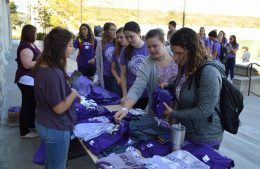 The K-State Parents and Family Association aims to communicate changes that occur on campus to parents in a timely, thorough, and direct manner. Annie: Let’s get to it. 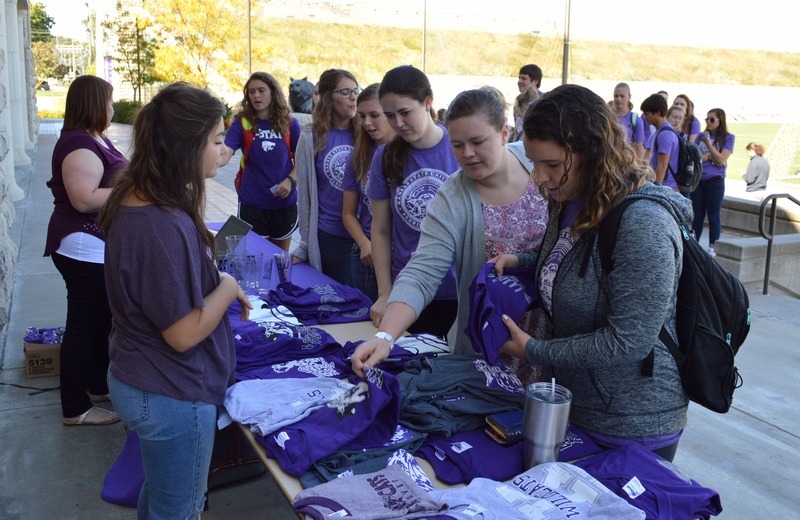 K-State encourages all students to get involved in student organizations, which provide many opportunities for leadership, personal growth, community service, professional development and learning from others. Tell us about the newly formed Center for Student Involvement. Heather: This summer, the Office of Student Activities and Services and the Office of Fraternity and Sorority Life merged to form the Center for Student Involvement (CSI). The center, in the newly renovated Student Union, assists with registration, provides information to students and offers programming on topics such as leadership development and offers resources to nearly 500 student organizations. We just hired a new executive director, Kelli Farris. 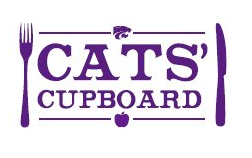 The recently announced logo for the Cats’ Cupboard. This logo was voted on by K-State students, faculty and staff. This semester was a big one for our NEW campus food pantry. Cats’ Cupboard celebrated it’s grand “CAN” opening in October alongside students, alumni, faculty, and staff. Supporters all across campus stopped by to see the pantry space, donate to the pantry, hear from students and faculty that helped start the pantry, and help promote this resource for students! 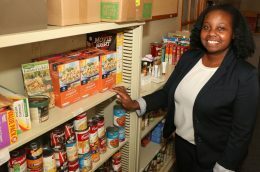 As you might recall, we previously had a feature on Erin Bishop, the food pantry coordinator, and how she carries out the vision of the food pantry. That mission is to prevent food insecurity from being a barrier to student success. Awareness, as well as access to healthy food, is essential to her role and the role of the pantry moving forward. The collaborative effort of student life and academia will lead the way for practicing real change and enhancing K-State’s land-grant mission. With space in the basement of Fairchild hall (009), a central location on campus, the shelves are stocked and the accessibility of food and other necessary items is now there for students. The 2016 National College Health Assessment concluded that over 50 percent of college students sought out treatment, over the course of a year, for illnesses ranging from allergies and back pain to strep throat and ear infections. It’s inevitable that at some point in college, your child will get sick. When they do feel ill, Lafene Health Center is ready to help. Located on campus, west of Kramer Dining Center, Lafene is conveniently located for a quick visit with a professional staff member. Lafene has services ranging from allergy and immunizations, X-ray’s, a women’s health clinic, and physical therapy to name a few. The biggest difference between Lafene Health Center and a private doctor’s office is the cost. Students at K-State pay a specified privilege fee each semester which helps subsidize the cost of student health services. Most of the time, a short appointment without equipment or labs will be at low cost or no charge. Additionally, services including the pharmacy, laboratory, X-Ray’s, Physical Therapy, etc. are charged to students (mainly via health insurance) at a much reduced rate. This content was originally posted on the K-State Powercat Financial Services Blog on November 6, 2017 and was written by Gretchen Holthaus. Powercat Financial Services is a peer-to-peer program where students studying financial planning or financial services offer counseling to fellow students on budgeting, saving, credit, student loan repayment and transitioning to work. K-State Parents and Family Association wants to advise students and parents on some smart money habits throughout the holiday season. Time with students, and family, is special and we hope this article is useful as we celebrate the holidays! During the holidays money can be tight— especially with all the pressure to get everyone you know a nice and meaningful gift. Below are some helpful tips for you and your wallet during the holidays. First, list out all the people you’d like to get gifts for. After you do that, look through it again. Are there people on there that you maybe have lost touch with or don’t talk to as much anymore? If you are working with a tight budget during the holidays, it will be beneficial shortening this list to those you still have strong relationships with. Another way to shorten your list would be to start a Secret Santa. Instead of you and your friends getting a gift for every single person, start a Secret Santa. 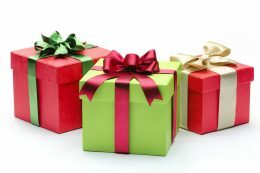 This will limit the number of gift purchases while also allowing you to focus on getting a nice gift for one person instead of however many smaller gifts to stay in budget. Sarah Barrett literally followed her dreams and came to Kansas State University. 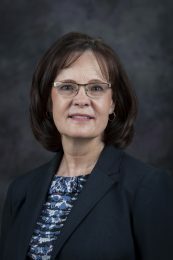 She now works at the university as a Cleary Act federal compliance coordinator, making sure the university reports crimes properly, helps with federal aid, grants and “continues the mission of serving students,” she said. However, she also recently turned her personal struggles into her passion and second aspect of her job. Would you like to get your K-State student more engaged on campus? Why not encourage them to join Wildcats Forever, one of the best traditions and largest organizations on campus! 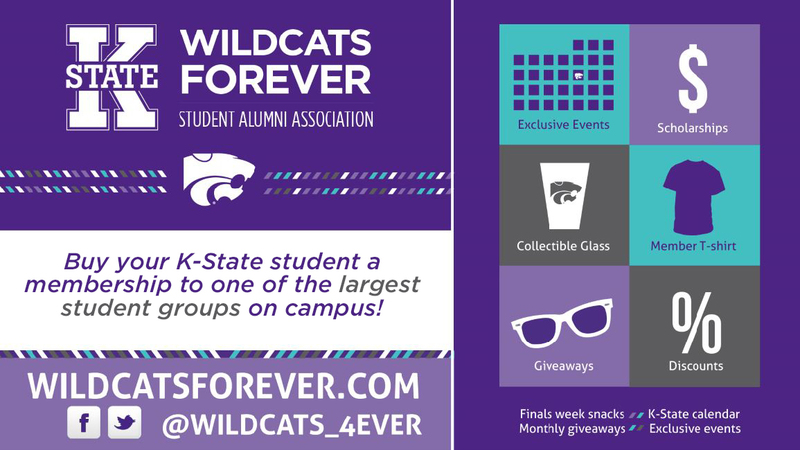 Wildcats Forever is the K-State Alumni Association’s organization for students. For only $20, students receive a membership T-shirt, a collectible glass and a membership card with discounts to their favorite places in town. Some of the discounts include Call Hall Dairy Bar, Acme Gift, Colbert Hills and much more. There also are opportunities throughout the year to participate in events, contests and giveaways. Anything goes — we give away items such as snacks during finals week, pizza, K-State apparel and scholarships. And don’t worry — your student won’t need to attend any meetings or take on other responsibilities when they become a member of Wildcats Forever. We just want them to enjoy the awesome benefits and strengthen their connection to K-State! 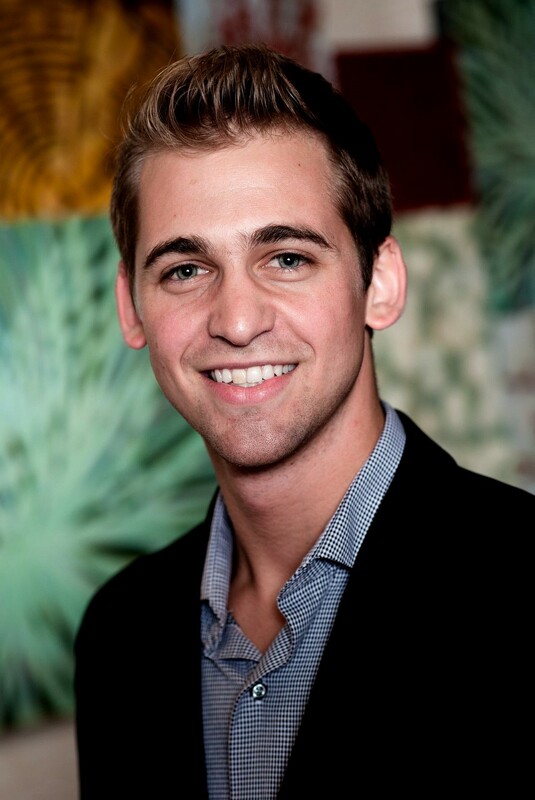 “Wildcats Forever is a fun and easy way for current undergraduate and graduate students to start getting involved with the Alumni Association and learn about all the services we can offer them — both during their time as students and after they graduate,” said Marcus Kidd ’14, ’16, assistant director of student programs. To join Wildcats Forever, your student can stop by the Wildcats Forever booth in the K-State Student Union during orientation and enrollment this summer, or they can sign up anytime online through their KSIS account. You can also gift a membership to your student. Learn more about Wildcats Forever or give us a call at 785-532-5056.